Part soap, part scrub and totally amazing! Each piece is a single use scrub that can be used for hands or in the shower. Dampen hands and piece under warm water. Piece will crumble into a wonderful, exfoliating scrub that will suds like a soap and rinse cleanly away leaving behind soft, smooth skin! This type is scented with Ylang Ylang, Orange and Lavender organic essential oils- expect a warm, floral scent! Ingredients: our very own cold process soap (saponified coconut, olive and palm oils, cocoa butter), Argon and Avocado Oils, Cocoa Butter, mica, organic Ylang Ylang, Orange and Lavender Essential Oils. 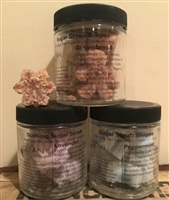 Each piece is a single use scrub that can be used for hands or in the shower. Dampen hands and piece under warm water. Piece will crumble into a wonderful, exfoliating scrub that will suds like a soap and rinse cleanly away leaving behind soft, smooth skin! Our Peppermint Snowflakes are colored with body safe mica and are scented with organic Peppermint essential oil that is uplifting and crisp! Makes a great gift or stocking stuffer! Ingredients: our very own cold process soap (saponified coconut, olive and palm oils, cocoa butter), Argon and Avocado Oils, Cocoa Butter, Mica, organic Peppermint Essential Oils.